Yes, I pack my dinner for lunch the next day. No, not because I'm stingy and wana "harn". Eh, you everyday eat out also will be sien, kan? I pack my own lunch from home, say, 1-2 times a week. Sometimes more. Depends. 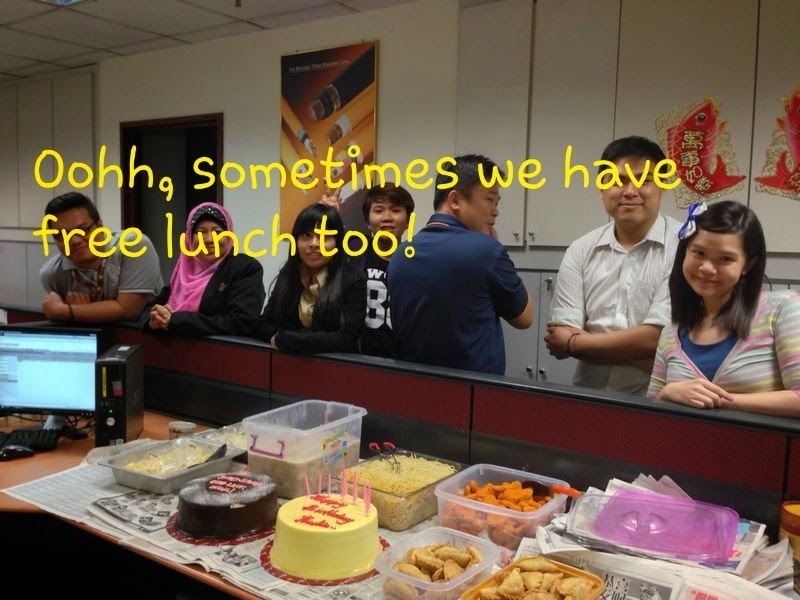 Like for the past few weeks, due to the bad haze (and water ration issues), the guys in the office were reluctant to eat out for lunch, so we brought food from home often. If I decide to skip dinner that day, I would pack my dinner to work for lunch the next day. I'm only a glutton on weekends, but am absolutely a normal human being on weekdays. I only have a cup of beverage for breakfast, a bowl of noodles (or whatever the others are having) for lunch when I'm out with my colleagues, and skip dinner sometimes. Oohhh sometimes my mum and the mil give us food & soup to bring home too, usually on Sundays when we visit them. The food can last for two days, sometimes three - max. Just to share what's in my lunch box if I pack food from home. Pssstt, if you see canggih dishes, means they are from either my mum or the mil. If you see "chin tan" or "chau choy" or baked beans, means they are from myself, tee hee. Morning, Louiz! Wah, I like all your packed lunches! Looks good and you have quite a variety. So how do you do it? I mean do you need to heat the food up before packing it in the morning? Or you can heat up in the office pantry (got microwave)? I like the idea very much. 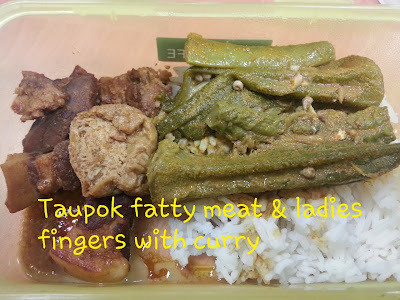 I did think of tapau food from home but I feel that it takes up a lot of time. So I senang-senang just tapau from chap fan shop. Maybe I should consider doing like what you do when the stupid water rationing is over. I haven't been doing proper cooking lately. Only baking. 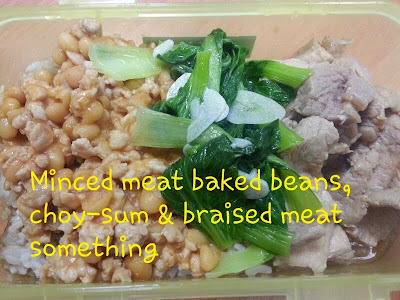 I "sun bin" pack the food into my container during dinner time. Then put in fridge lor.. In the morning, I take out from the fridge, straight into my bag, and leave for work. During lunch time, I'll just "ding" (reheat) in the microwave, yep, there's one in the pantry.. I know it's not good. Some health freaks will be telling me microwaving food is not good *pssst, who dunno mum is a woman*, but not always, and I makesure I don't over "ding", maximum 10 seconds on medium high.. 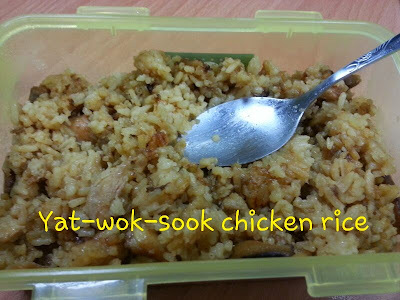 I like the yat-wok-sook chicken rice!!!! You really wear ribbon goes to work?...hahaha~~~ no wonder they called you Princess Ribbon since the beginning, hehe!!! Xiao Ying, oh yes, I always wear a clip to work.. Either normal clip or ribbon clip.. Depends, hehe..
Ok la , even ate outside also the same. The usual oily with ajinomoto chicken rice, economical rice ... etc. Unless you go for good food at restaurants but then you can't do it everyday. Yep, we don't "kiu soong" everyday, can't anyway.. Once or twice a month.. Usually I just follow the group, I eat whatever they eat, usually in kopitiam or food court..
Wow! Your bento boxes have delicious food! I would be happy to eat like that to save time and money too so that can travel some more! Once or twice a week I will bring food from home lor.. Not everyday they are willing to go out (and drive).. Like you say, some people very selfish one la, scared die wana drive out like that..
No copyright, anything for you my dear.. Really.. I use Line Camera apps, then edit using text.. Go get it.. I guess your office celebrated 2 birthdays that day! My colleagues do not celebrate birthdays except for bosses as we have a bunch of selfish people. Depends on mood, sometimes those crazy colleagues will organize birthday lunches and buy their own cake, we just have to eat, but at the end, we still fork out some money to buy gifts, coz paiseh wana eat free lunch also la, kan? Homecooked, anytime better than eating what you can get outside. 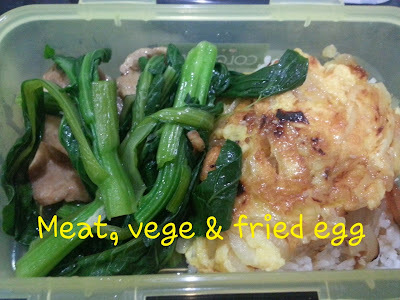 Yep, I appreciate MIL/my mum giving us food sometimes, else, it will be fried vege and fried egg everyday.. hehehe..
oh I seldom eat out as I will cook for both meals. My kids dislike economy rice which sometimes I have to do it. I don't mind 'chap farn" but not everyday la, hehe, will be sien.. And sometimes it's oily too..
very true also.. eventually there is surely one day when you have finished trying all the food available around your office, and there is surely one day when you are bored with the food that you can get around your office.. unless you always drive out to different places to try different things lah.. so i also can understand that geh, that's why i say, sometimes having to decide what to eat for lunch is something challenging lor.. so some times bring your own lunch will be a little different so that you won't get bored with eating the same old things again and again, repeatedly and repeatedly.. if a lot of makan places around still okay lah, some work place hor, only got one canteen or cafe within that 100km diameter, those really very cham lor..
good lah, actually i don't mind bringing leftover from dinner back to office for lunch the next day woh.. but then would be nice if there is a microwave in the office so that we can ding to heat up the lunch box a bit lah, else cold one i also okay one.. i have no problem eating cold dishes lah, so long as it is still the same thing and same taste lah, haha!! not very particular like some people, must be piping hot baru want to eat geh.. for example, i can eat cold chicken.. neh, sometimes bought back from Ipoh those salted chicken leh, everyone say i am weird to love it cold.. but it really taste nicer after placing it int he fridge over night, and then makan just like that taken out from the fridge.. nothing's wrong to me lor actually, but some people heard that and like i am a weirdo and ask "cold one woh, can eat meh", cheh, ngo bud ji gei jung yi eat it cold ah.. there is always a dish which is cold chicken if you ever had western cuisine mah.. I'm laughing so loud now.. 100Km diameter? Lei zhan hai kua cheong, kekekeke.. Ya la, but I get your point, everyday eat same thing same place also sien.. Sometimes ahh, really, not kidding, eat soda peang with milo for lunch also taste so nice you know once a while..
Oh yes, I'm like you too.. I don't mind digging cold from the fridge.. 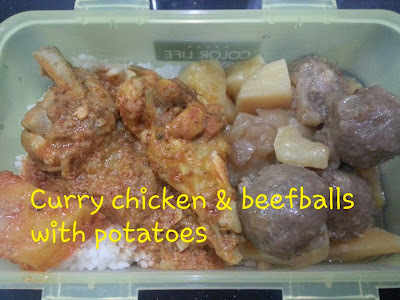 Yesterday hubby brought some food back from MIL.. She already put in container in the fridge.. So the food was still a bit cold when he brought it back.. I terus open the container and dig with my finger and eat just like that.. Cold cold, and the layer of fat was floating on top, I just dig and eat, don't care.. I think not many people can do like me..
Ooohh, I know the chap-farn delivery you are talking about.. Biasa la, office sure will organize one.. But then I'm thinking, how long can you do it.. 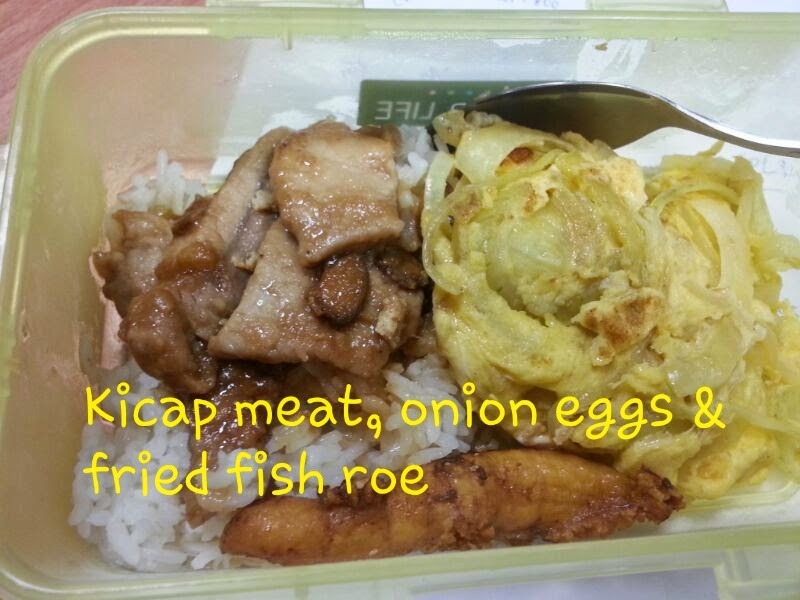 Everyday eat chap-farn also sien wor.. Sometimes you all gatal wana merayap go outside and eat or wana eat other things, kan? We also did like you for a week or two, then stopped, coz we "3 minit hot".. Hahahahaha..
Wah... everyday feel with warm hearty meal - lunch box! Thumbs up gal. You do your work sin, don't bother about commenting, totally understood! 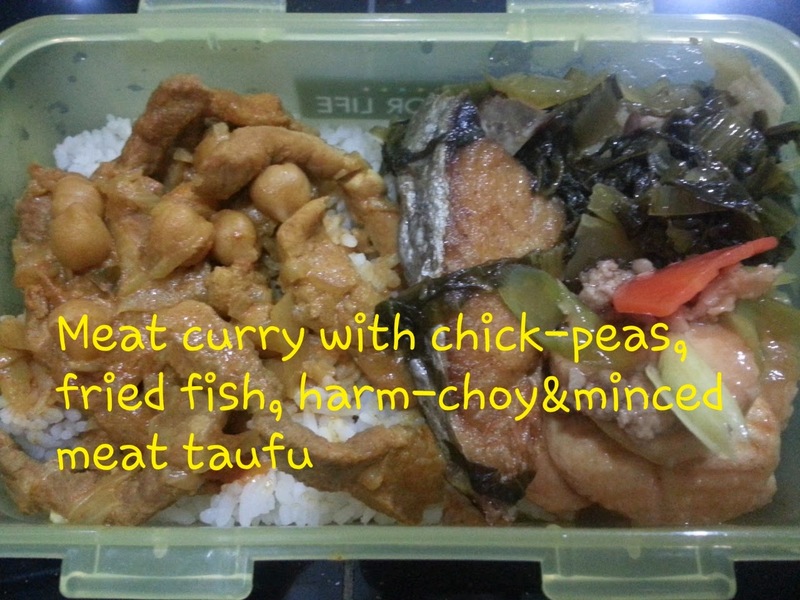 Yummy lunch boxes! Self packed lunch box is always healthier and yummier la! All of them look so yummy. I want! 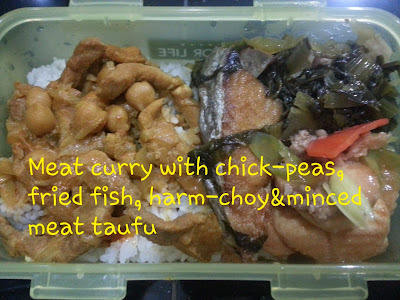 Hehe, thanks.. Ala, normal simple home cooked food only.. Back from work no time to cook canggih dishes..
Yep, hubby only knows simple style of cooking "chin tan chau choy" (he cooks if he reaches home earlier).. 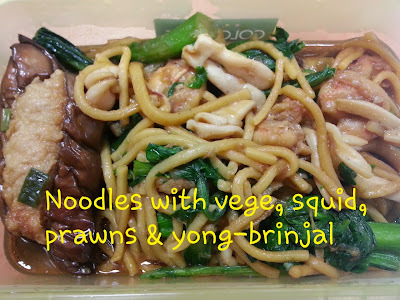 If me, I terus rebus pasta, throw in a can of Campell mushroom soup nia..
Tarak pack ang moh food a bit ka? Or not filling enough? Babe, if angmoh food is gonna be pasta+cream sauce, susah mau leave overnite and bring to work the next day, coz all will be absorbed by the pasta, and pasta will be soggy, and no more sauce the next day.. Takut basi lagi with the cream and egg and all.. Your lunch box is very "fung Fu" lah. I never pack that much in my takeaway from home to office. All leftover food from dinner the night before my dear.. Ohh, if you see those "fung fu" dishes would be from my MIL (when she packs food for us on Sundays)..
Home cooked food is always better and healthier than outside food! Your packed food look delicious! Yep, agree, but only once or twice a week.. Hehe.. Sometimes prefer to follow them out for lunch, to merayap, kekekeke.. Yes now with water rationing I have to plan where to eat everyday. There is Zone 1,2, 3 and 4 to think about. Certain days have water in different zones so it get a bit confusing sometimes LOL! Yeah, correct.. If our area no water, and if we wana go somewhere near to eat, feel geli also la, coz we dunno where their water comes from also right.. But with no water, it's also a challenge to cook at home. In fact, I eat out more these days because of water rationing. But have to plan first cos got to know which area have water and which does not. The other day, our area kena.. That day was the no-water day.. Hubby took us out to the kopitiam just outside our house to eat. Errr, feel geli lor, but no choice, with two rascals around, everything has to be fast and near.. Makan jugak in the end..
Yeah, coz I was gaining weight fast.. Have to control.. You see, morning 7.30am eat carbo, then 12.30pm lunch carbo again, then dinner carbo.. Gaining weight fast.. Previously, I was having porridge/nasi lemak for breakfast.. Lunch noodles or rice, depending what the others are having.. Then dinner rice again.. Wah, gaining weight fast.. Like a 2 pounds a weel (that's 1 kg, babe).. So I stopped and changed some eating habits lor..
Wow, those dishes are very canggih to me! Your mum must be a very good cook eh? And oh my, you are really a small eater. I thought I am a small eater but you're the champ! bringing lunch from home is healthier. I'm bringing lunch from home too. Cooked by my MIL.